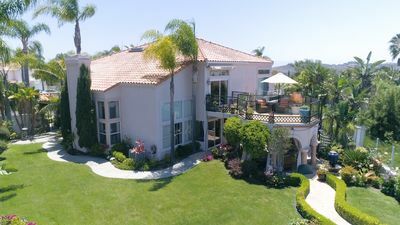 This gorgeous, 4-bedroom, 4-bath, air conditioned, tastefully appointed vacation home - in the center of Corona Del Mar Village, offers a lovely well-designed lounge (3rd floor outdoor living space) where you can comfortably watch TV and enjoy gathering with your family or friends at the same time! 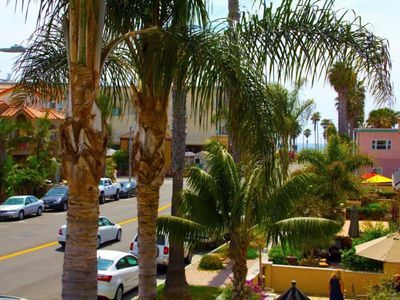 Located off the well-known Pacific Coast Highway, it is just a short walk to all the restaurants in the village. 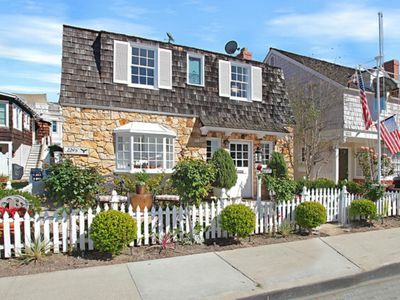 It is also a 2 minute drive from Fashion Island Mall and the ocean is a short drive or walk away (1 mile). 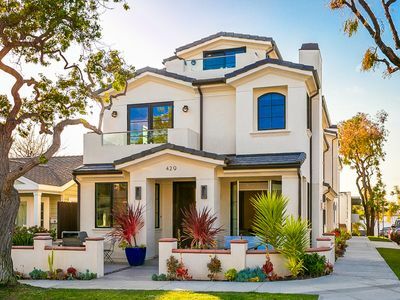 This newly constructed 3- story 1800 sq. ft. front unit of a duplex is designed with a wonderful natural flow between indoor and outdoor spaces – creating an ambiance of serenity, flow, and class at every turn. This beautiful home, with all wood floors, features an open, spacious great room with an abundance of light and a wrap-around sofa from which you can easily enjoy a fire or the flat screen TV. 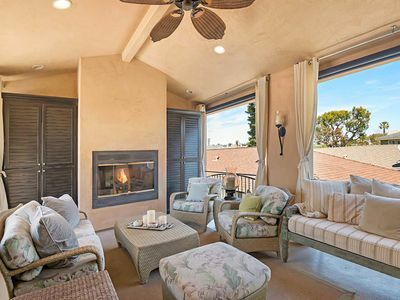 French doors from the living room lead to an “outside living room” patio space with places to lounge, relax, and barbecue. 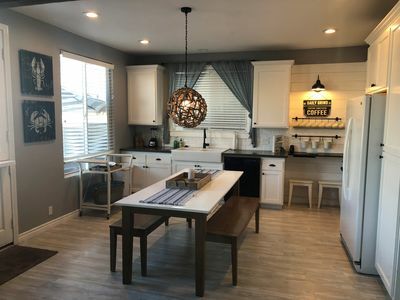 A light, bright Chef’s Dream kitchen with a 5- seat breakfast nook has everything you need to satisfy your culinary needs. 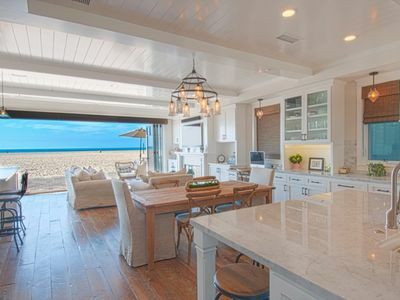 A dining room for 8, 3 high-top stools at the kitchen bar and the breakfast nook provides seating in the great room for 16 – so everyone can easily eat together. 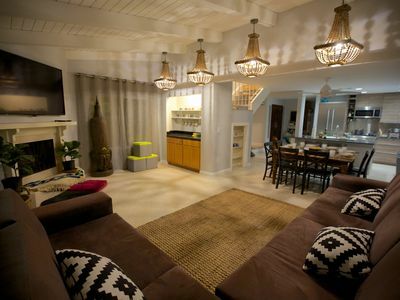 The 2nd floor king master bedroom showcases a private balcony, a large flat screen TV, and an Ensuite Master Bathroom. A sensational master bath features a large soaking tub, and a spacious walk-in shower to complete this peaceful haven. There are 3 additional bedrooms: A queen bedroom, with a shared hallway bath with a walk shower is on the 1st level, a 3rd bedroom with 2 twin beds and an en-suite bath with a walk-in shower is on the 2nd level, and a 4th bedroom with a queen bed on the 3rd level, also has an en suite bath with a shower tub combination, as well as a private balcony. 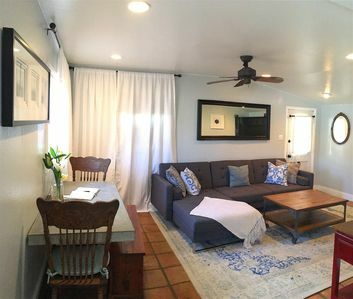 The 2nd level also features a chic lounge space with a full sized pullout sofa and a flat screen TV so this home comfortably sleeps 12. 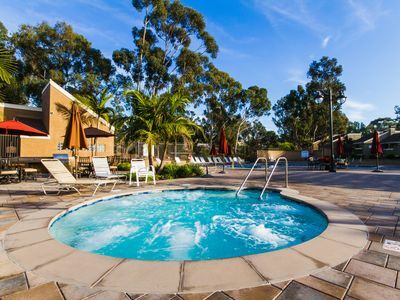 On the 3rd , or top, level of the home, you will find a fantastic lounge with plenty of seating and a large flat screen TV that is great for gathering with family and friends while basking in the mild Southern California weather. All TVs in this home are equipped with cable and WIFI. 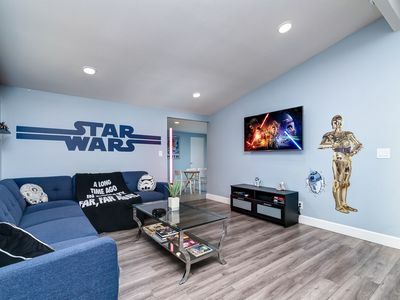 This home has air conditioning, a washer and dryer for your convenience, and there is covered parking for two cars, one of which is in the garage. 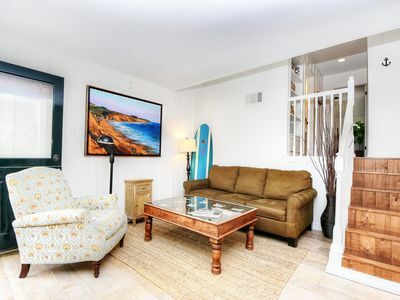 -Just 1 mile to the beach and a short walk to dozens of restaurants, stores, coffee shops, and bars. The nearby world famous “Fashion Island” shopping center has yoga, Pilates, and a gym. 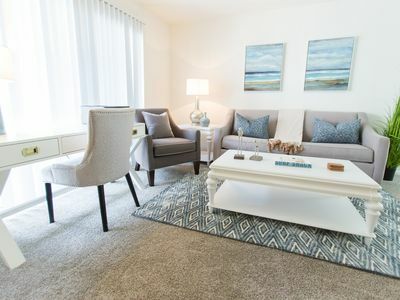 -Interior and exterior design is wonderfully versatile - so everyone can find places and combinations that can work - for everything from eating together to finding a quiet place to read, take a nap, or just hang out together. 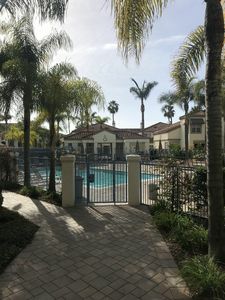 -No smoking is allowed inside or outside any of our properties – NO EXCEPTIONS! 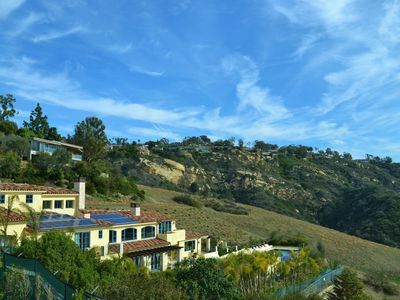 -This home has 3 levels with many stairs and no elevator, so it is not suitable for everyone. 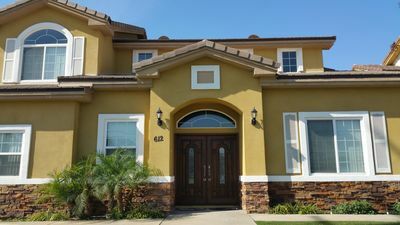 -This house is equipped with air conditioning. Additional fees may apply, so please contact our Reservation Team for details. SeaBreeze Cleaning Fees – SeaBreeze only uses legal housekeeper companies who are dedicated to paying a living wage and carry all legal insurances required by law. 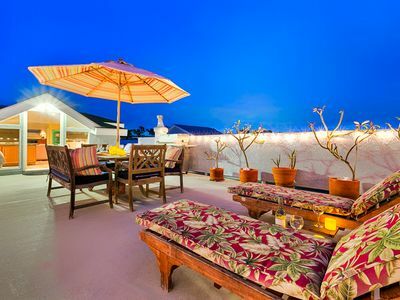 20% OFF APR - Rare & Amazing Studio w/ Roof Top Deck + Views! 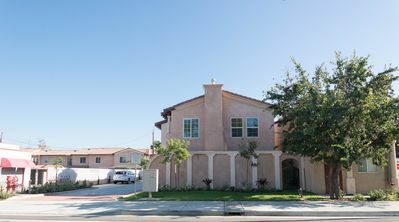 Family Home Located in the Heart of Orange County. 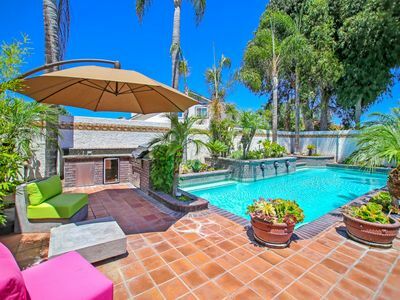 Just renovated this beautiful 3bd condo, jaquzzi&pool&bbq adjacent to the park! 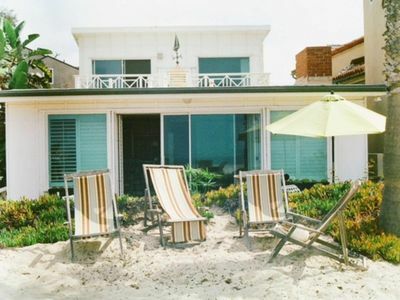 Oceanfront+Classic+Stylish single family beach house. No crazy boardwalk=quiet!